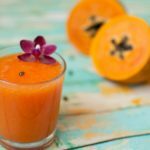 This smoothie is a vitamin-rich smoothie with lots of minerals and fiber and digestive properties. Put all ingredients into a blender and blend. Add enough olive oil till the constitency is to your liking. Yes, I would like to receive emails from Marvalhas. Sign me up!